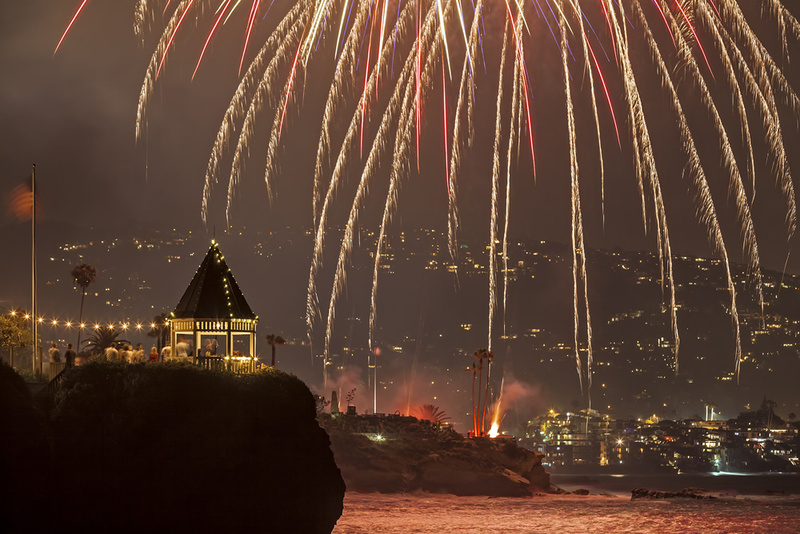 Independence Day in Laguna Beach glitters with fireworks. Photo by Mitch Ridder. The Summer Breeze Bus Service to Laguna Beach begins this Saturday, June 30, but only operates weekends, so will not be available for use during the upcoming July 4 holiday. 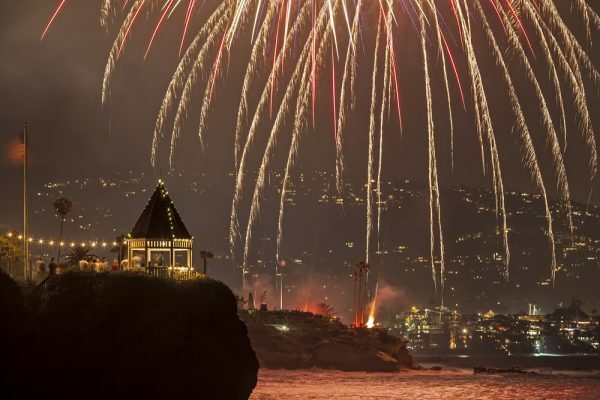 Fireworks for the July 4 holiday in Laguna Beach will ignite over Monument Point at Heisler Park and will begin about 9 p.m., according to a city statement. The area around the point will be off limits to picnickers all day as well as the area of Heisler Park from Myrtle Street to the Rockpile Beach stairs at Jasmine Street. Visitors should comply with city park and beach ordinances, which forbid alcohol, smoking, unlicensed drones, tents, barbecues and fireworks. Dogs are also banned from city beaches in summer from 9 a.m. to 6 p.m. The city advises July 4 visitors to use the free city trolleys, which will operate from 9:30 a.m. to 7 p.m. on the Coastal Route and 8:30 a.m. to 7 p.m. on the Canyon Route. Though visitors who don’t plan to stay for pyrotechnics are encouraged to use Laguna Canyon Road parking lots and take the trolley into town. The center lane of Laguna Canyon Road, between Canyon Acres and El Toro Road, will be reversed once the fireworks show is over, the statement said. The Summer Breeze bus will run each Saturday and Sunday from 11 a.m. to midnight until Sept. 2. It travels between the SR-133/I-405 parking lot and stops in the art festival district and downtown bus station.